World number 22 Michael Holt says his return to the Crucible is a chance to right the wrongs of last year's crushing first-round defeat. The Nottingham potter was beaten 10-1 by current world number 10 Ricky Walden, but insists he has not been mentally scarred by the loss. 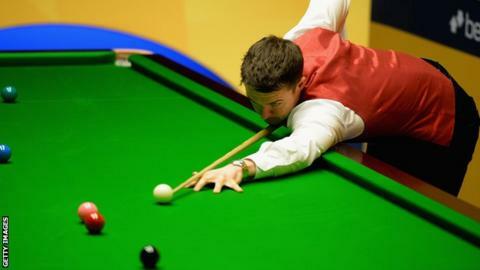 Holt faces Mark Allen in Tuesday's World Championship opener. "It's in my mind in a positive sense because I want to put it right," Holt, 35, told BBC Radio Nottingham. "I went there last year really positive and was looking forward to it but it just went pear-shaped. It can happen there and it has happened to better players than me. "Before I knew I was 6-0 down having missed a few but he played well to be fair and got to the semi-final. "He was playing well so I cannot really dwell on that. In qualifying it was on my mind that I was so disappointed so it has made me more determined if anything." Allen, the world number 14, stands between Holt and just his second appearance in the second round at the Crucible. Holt, who made the last 16 in 2005, is not looking too far ahead but would dearly love to set up a possible meeting with Neil Robertson. "Mark is a champion, a great player and has won major events," Holt said. "If I miss balls and play badly he will beat me so I have to be in the right frame of mind and enjoy it. "Neil is a great player. He is the number one player in the world and is a proven champion who has won everything. But I'll have to concentrate on Mark first so I'll cross that bridge if and when I come to it. "I believe in my ability and I believe I can play well enough to beat anyone at any stage. I just want to get as deep into the tournament as I can and see what happens. And Holt will take inspiration from 2013 finalist Barry Hawkins. "I look at Barry, who is a really, really good friend of mine, and nobody said he would get to the final," Holt added. "If you get a run going, play well and get a bit of confidence then you never know what can happen. I am really open-minded about it."